And if ever we face any troubles with the product, then there would be a good customer service to help us through. 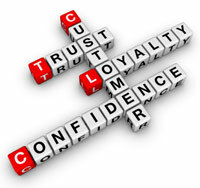 And if a customer finds all these three together, then they automatically become loyal to the product. Or the brand should we say! Brand loyalty is not easy to come by. A company ought to strengthen its business support system if it wants to be the stronger player in the business. A company should opt for a customized BSS solution that is able to compress complex functions into a simple user interface. Like in the case of telecom solutions, if all the services requested by the customer like activation of connection, activation of VAS, billing etc. can be performed without much hassle, then the customer will definitely prefer this brand, again and again. So the companies which want to develop brand loyalty must focus on integrating their business functions. The backbone of OSS and BSS billing solutions makes a business taller in the market than the rest. This entry was posted in Telecom, Telecom Billing Solutions and tagged BSS Solutions, BSS solutions provider, BSS System Software by admin. Bookmark the permalink.